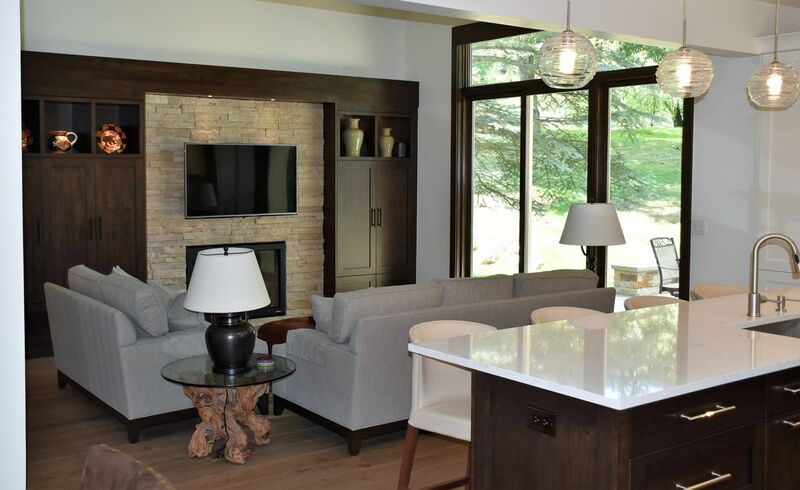 BEAVER CREEK - Fully renovated, beautiful and spacious (2150 square feet) 3 bedroom, 3 bath two-story duplex in Beaver Creek with an open floor plan. The home has a fully-equipped kitchen with new stainless steel Kitchenaid appliances, quartz countertops in kitchen and bathrooms, 3 TVs (including a 55" smart TV in living room), DVD player, Sonos speakers, washer and dryer, gas fireplace, patio, gas grill, 1-car garage, and complimentary wireless Internet. First floor bedroom has 2 sets of bunks beds. Upstairs are 2 master suites, one with a King bed and the second with a Queen bed, both with flat-screen TVs, walk-in closets, and private baths. In the summer, relax on our patio overlooking the Beaver Creek golf course, or enjoy the pool, hot tub, and tennis courts located a few steps from our front door. In the winter, enjoy sledding, snow shoeing or cross country skiing on the golf course just outside our back door. Free Dial-A-Ride shuttle bus service brings you quickly from our home to any location in Beaver Creek, including the slopes, golf clubhouse, and restaurants (free shuttle available 7am until midnight). Two common-area hot tubs are open year-round; the heated pool is open summers only. The outdoor tennis court (which has also been lined for pickle ball) is available for your use, weather permitting. Our spacious home is within the gates of Beaver Creek resort. This sunny home features hardwood floors, vaulted ceilings, a gas fireplace, 55" flat-screen TV, and lots of space. The fully-equipped kitchen, breakfast bar, dining area, comfortable living room, two master suites (with walk-in closets) and a bunk room make it a perfect home for families. In the winter, you'll appreciate the ski rack and boot dryer in the garage and sleds for the kids. Year round you can enjoy the games, books, and DVDs left for your use. And you'll enjoy the convenience of being within the gates of Beaver Creek, with its excellent shops, restaurants, and ski school. Convenient shuttle bus service: Don't hassle with loading up the car and parking! Enjoy the free Dial-A-Ride shuttle bus service to get around Beaver Creek. The shuttle bus picks you up at home and drops you off at the ski slopes or any location in the Beaver Creek resort. Catch the shuttle bus again when you're ready to return home. If your whole party isn't ready to go at the same time, you can catch the bus in shifts so everyone can get to ski school or the slopes at their own pace! This is a non-smoking property; no smoking is permitted in the home. Pets are not allowed. Parties are not allowed. We're a family who loves to ski and snow shoe in the winter and loves to hike, bike, swim and enjoy the fresh mountain air in the summer. We chose Beaver Creek because it is a great family resort, with a fantastic children's ski school and many activities year-round. We chose this property because of it's spaciousness and it's location. In the winter, we love that our kids can go right out our back door and play in the snow. In the summer, we love to sit outside on the patio or at the pool and enjoy the beauty of Beaver Creek. Our home is right in Beaver Creek (not in Arrowhead, Bachelor Gulch, Avon, or any other place that likes to call themselves Beaver Creek). Our back patio overlooks the Beaver Creek golf course. one spot in garage and one spot outside of garage. Additional parking at the pool. Parking for one car in garage plus one car outside of garage. spices, flour, sugar, oil, vinegar, etc. large flat screen smart television in living room plus a flat screen tv in each of the upstairs bedrooms. outdoor tennis court just steps from our front door - open weather permitting. The court has also been marked for pickle ball. Our patio is on the Beaver Creek golf course. Many other courses are nearby. This condo has everything you need for a wonderful ski vacation at Beaver Creek. The entire condo is updated and pristine, especially the kitchen, which is well-equipped with everything from high-end appliances to sharp knives! The location and amenities were perfect for two families of 4 to share. Shuttle to the ski area is very convenient. This was our third trip to Beaver Creek--we stayed at the Westin the first two times--and we would definitely stay in this condo again next time. It has all of the convenience and comfort of a high-end resort hotel, but with more amenities, more room to relax more of a "home away from home" feeling. Not to mention what we saved by cooking our meals instead of eating out. Our family cannot recommend this condo highly enough. We hope to come back and stay again in the future. This was our second time back to this property. It’s our favorite. It was clean & well stocked. We appreciated the thoughtful details of supplies since we flew! The location is so pretty on the golf course and the shuttle super easy. Will be back! Erin - it was nice to have you back again. I'm glad you enjoyed your stay, and thank you for taking such good care of my home! Excellent locAtion. Comunication with the owner real good. The property is just like the picture cousi and clean. We love it. Guillermo - thank you for your nice review. I'm glad you and your family enjoyed your stay! Beautiful home for our family vacation. Great location for biking, hiking, golf and enjoying the mountains. A wonderful property, comfortable home, great location, fully equipped! We were so impressed with this home! Spacious, cozy, clean, and the kitchen was fully equipped....it wasn't lacking anything. Bathrooms were beautiful and very comfortable. The homeowner, Mary, was friendly and helpful in assisting us with any questions we had even before arriving at the home. We had a wonderful stay and fell in love with this home! We are definitely planning on renting it again! We enjoyed this townhouse so much. It was well equipped with all we needed in the kitchen and bathrooms. A very convenient location and the shuttle service was excellent. So easy to get around places. We loved having fires in the fireplace at night after skiing all day. The bathrooms have been updated nicely, and we liked having 2 master bedrooms as we went with another family. We will rent this place again. We're located within the gates of Beaver Creek, with quick access to all that Beaver Creek has to offer. Our patio overlooks the Beaver Creek Golf Course. Our front door is just steps from the common pool and hot tubs for the Fairways town homes. The rates listed above assume payment by eCheck. Please pay by eCheck to avoid additional fees. Ask about discounts for longer stays. 10.99% tax added to stays of less than 30 days. Security deposit or damage insurance required.